Buckman Coe has vowed to remain barefoot until he can get a pair of JJ Casuals, the shoes that look like feet. 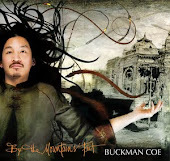 Clearly not a man content to have just a single iron in the fire, Buckman Coe keeps plenty busy when he’s not on-stage or in the studio. In addition to being one of those artists who make genre-jumping seem effortless, he’s also, according to his Facebook page, a certified yogi, eco-psychologist, and poet. If this were 1973, back when singer-songwriters ruled the earth, Coe wouldn’t have much time for side pursuits—with a couple of breaks and a bit of AM radio airplay, he’d be busy cashing gold-record royalty cheques and house-hunting in Laurel Canyon. If that sounds hyperbolic, it shouldn’t, because By the Mountain’s Feet, his second full-length, is really that good. Working with a supporting cast that includes Vancouver music-scene vets Brian Minato on bass, Steve Dawson on pedal steel, and Paul Rigby on guitars, Coe dabbles in everything from down-home Americana to sun-sweetened folk to soul-drenched blues. Aside from the fact that the dude sounds completely thrilled and blessed to be alive, what stands out are the gorgeous little touches—like the calypso-tinted guitars in the lite-and-breezy “Not So Farfetched” and the molasses-dipped harmonies in the wonderful country comedown “Plot Thick It Grows”. Because this isn’t 1973, Coe isn’t going to find a ready-made, built-in audience for By the Mountain’s Feet, which sounds like it was professionally recorded at the Record Plant three decades ago instead of in rainy old Vancouver in the 2010s. That’s a shame, because if you enjoy the laid-back likes of Ben Harper and Jack Johnson, odds are good that you’re going to love this unrelentingly positive, completely accomplished triumph. Buy this man's album! It has been on rotating on my lap top for a solid 3 days now!